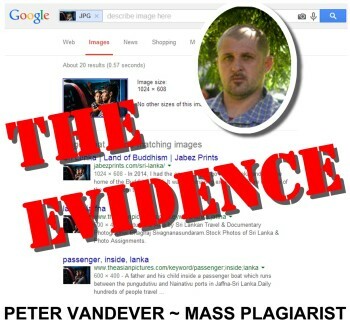 In previous posts I have taken up the cause of victims of Peter Vandever’s photography theft. I’ve shown deliberate theft, passing off, callous disregard for others and all done for personal profit. I’ve highlighted his different ways of viewing the world and shown example after example from multiple websites and Social Media, varying methods of theft and degrees of deception. In this post I provide the actual evidence by way of an entire copy of his commercial photography and website development business Jabez Prints taken today 27 March 2015. It shows the extent of his illegal activities. Peter Vandever established Jabez Prints as a commercial venture buying the domain name in 2013. He started into commercial photography in mid to late 2014. He commenced developed the Jabez Prints website in late 2014 and his course of deception culminated in a mass upload of plagiarised images in March 2015. He took his entire website offline in early March 2015, but pages still remained on Google’s cache. In time they will fall off Google’s search indexes though. While Peter removed Word Presses browsing (so that all pages pathed to the holding image) he did not remove the actual images. They still remained in situ and fully browsable directly. In a normal situation this would render the images invisible, for there would be no clickable link through to them and therefore the Search Engine robots would not know of their existence. The robots can only follow visible links. 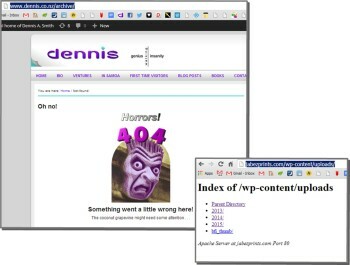 The reason that this simple command worked was that Peter had left open browsing on his sub-folders so that if there was no index file, Apache returned a list of files, rather than a 404 Error which is best practice for Server SysAdmins. Here is the difference between my server which returns an error when trying to access a subdirectory and Peter’s server that displays the files and directories. This failure in basic Server security enabled my wget to browse the entire uploaded files directory by directory and within a few minutes have an archive of all Peter’s plagiarised images safe and away from Peter’s “DEL” key! And all of this perfectly legal, and of course the last thing any image theif would normally want – bulk evidence in the hands of a third party. You are welcome to use this archive for legal purposes as you so wish, and I can provide additional evidence to validate the timing and/or legitimacy of this evidence gathering if you need it. I also have the data on backup locations for additional security. Just click through to each year/month to get an index page listing all the files uploaded month by month. You can see a few images uploaded in June and December 2013, a few in early 2014, more in later 2014, and larger volumes including many plagiarised images in 2015. To reverse search in Google, right click on the link and copy to your clipboard. Paste it into Google’s Image Search (https://images.google.com/searchbyimage?image_url=[pasted image URL here]) and then compare Peter’s image with the other URLs which in most cases are where he has stolen the image from. You will note that the thefts come in batches, typically travel websites and marry up with the commentary and examples I have provided to date. There’s your evidence . . . explore and see the true nature of the man who claims to be a Christian Missionary, web developer and photographer. You’ll find some other ‘interesting’ images in there too . . . enjoy. And Peter? I’d turn your directory browsing off in Apache on your server if I were you. That’s just Server Security 101. Terrorism is not something independent of world politics but simply an instrument … to install a unipolar world with a sole world headquarters, a pretext to erase national borders & to establish the rule of a new world elite. Small things amuse small minds. I never did anything much with it at the time. You ping someone like Peter Vandever or the PM of Samoa with the truth and move on. Bitterness is natural but unhealthy. Peter has health issues. I simply deal with facts, fearlessly. To the discerning, getting trashed by writing a book called “Corruption in Samoa” where I expose the PM’s infidelity for the first time in public actually increases one’s credibility. It shows those without an a priori agenda that I am fearless, prepared to pay the price and am probably on the nail. Peter Vandever lacks a good grasp of reality, has psychiatric issues and doesn’t realise what others can all see – twisting things for his own ends; laughing at the ‘misfortunes’ of others and applying logical fallacies creates more evidence of who he is. Most of the world are shocked and saddened at what happened to me in Samoa. Only a nasty, bitter fool would gloat about it – or someone who had psychiatric issues and didn’t play a straight ball. Unlike Peter, I’m actually ambivalent about exposure, but thanks to Peter nonetheless for the exposure. In regards to “bringing down his hate channel” I think that exposure of his thinking helps the world see who he really is. Remember that I am the one who put this document online, and wrote it up. I am the one who took Peter Vandever on and flushed his true nature out, relentlessly and effectively. The last thing I want is to be seen to cover things up. I do appreciate the heads-up though – thank you!